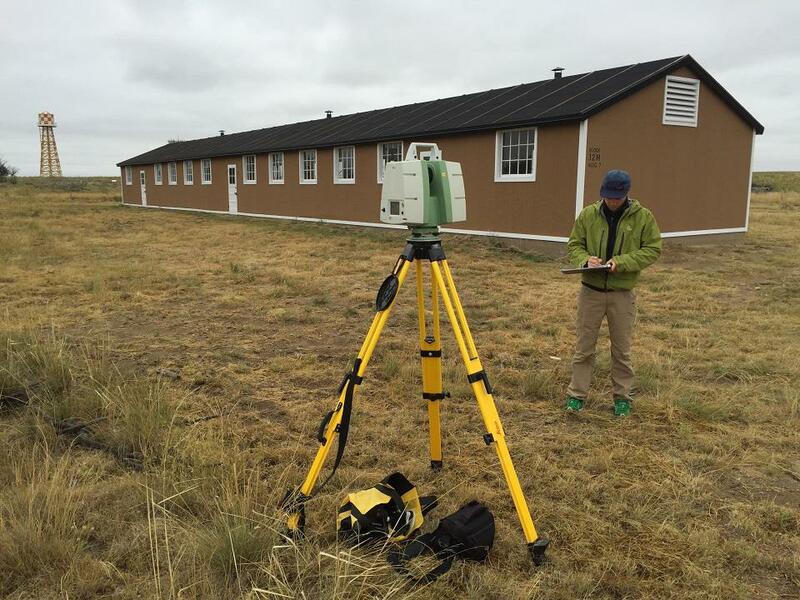 Mike Nulty with the Center of Preservation Research at University of Colorado-Denver uses LIDAR to scan the landscape at Camp Amache in southeast Colorado. 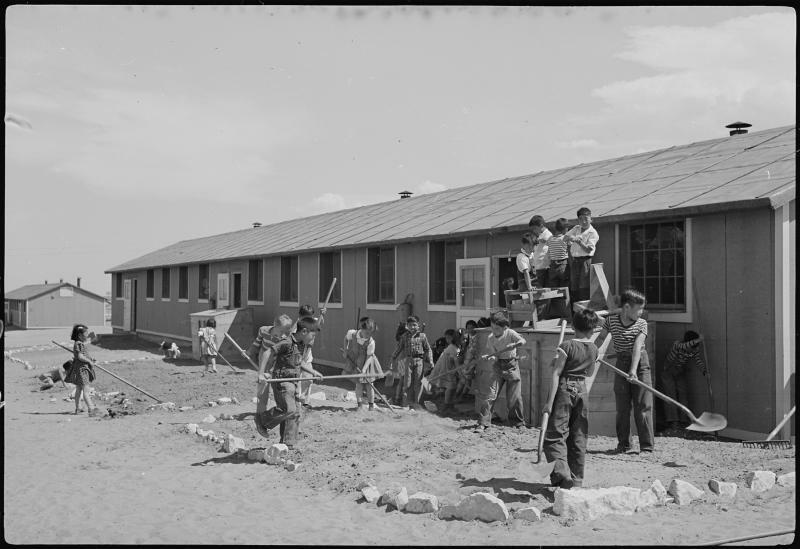 Elementary children landscaping the grounds at Camp Amache on April 24, 1943. The National Park Service is donating more funds to preserve, restore and increase education about Japanese American internment camps scattered across the U.S. Most of them are in the West. The funds total $1.5 million and are part of the agency's Japanese American Confinement Sites grant program. More than 100,000 Japanese Americans were forcibly imprisoned at the internment camps following the bombing of Pearl Harbor. Camp Amache opened in 1942 in southeast Colorado and was one of four camps in the Mountain West. Mike Nulty is with the Center of Preservation Research at the University of Colorado, Denver, which was given $37,000 to complete a project at the site. Nulty will be using the grant to create a 3-D model of the camp by digitally scanning the nearly 10,000 acre area using LIDAR or Light Detection and Ranging. That's a technology that measures distances using laser light. “In the landscape, if you're just kind of walking around, certain features might not be as obvious," said Nulty. "Especially features like koi ponds on site that haven't been kept up...or are sort of eroding. When we look at the LIDAR data, [it] allows for some really interesting visualizations of those areas and can make them a little bit more interesting than looking at them with the naked eye." Nulty said that at some point, the model could be used for reconstruction efforts, but for now, researchers are hoping to get an accurate picture of the site as it is today. 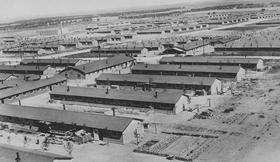 The camp, officially known as the Granada Relocation Center, closed in 1945. But some reminders of its existence are still there. That includes the foundation of the high school, a cemetary, remnants of koi ponds built by the people held there, and inscriptions where the internees wrote their names in concrete. Nulty believes the site serves as a historical lesson and reminder of how not to treat people. “I think we need to keep this history fresh and make sure we don’t repeat these kinds of mistakes," he said. At its peak, more than 7,000 people were held at Camp Amache. During World War II, our region held Japanese Americans in internment camps in Colorado, Idaho, Wyoming and Utah. Additional projects slated to receive grants include the Oregon Nikkei Endowment of Portland which will catalogue and post online more than 1,500 photos, paintings and artifacts related to the Minidoka Internment site in Idaho. The Japanese American National Museum of Los Angeles also received funds to create an exhibit based on the diaries and letters of a teenager who was killed in action during the war, while his family remained incarcerated at the Heart Mountain Relocation center in Wyoming.